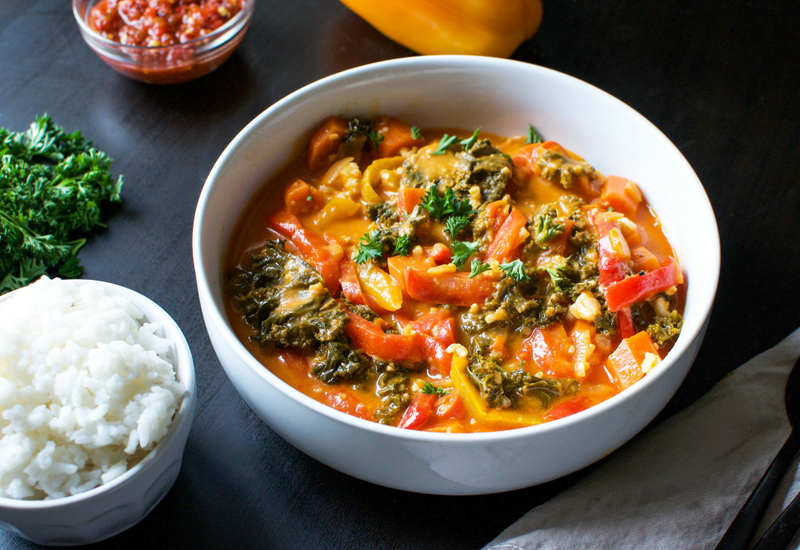 This delicious vegetarian/vegan dish consists of carrots, bell peppers, and kale in a red coconut curry sauce. The best part? You have a go-to recipe that is a delicious and budget-friendly alternative to a Thai takeout staple. This recipe just also happens to be gluten-free, dairy-free, and low-carb. In other words, everyone will love it! You will find yourself keeping a jar of red curry paste on hand to make this at least once a week! Heat oil in a pressure cooker set to Sauté. Cook and stir onion in hot oil until translucent, about 3 to 4 minutes; add ginger and garlic and continue cooking until fragrant, about 30 seconds. Stir carrots, red bell pepper, and orange bell pepper with the onion mixture; cook until the peppers are tender, 3 to 4 minutes. Stir coconut milk, kale, water, and curry paste into the vegetable mixture until color of sauce is consistent. Press Cancel and seal lid on pressure cooker, turn steam vent handle to Sealing, and cook on High Pressure for 1 minute. Turn steam vent handle to Venting to quick-release pressure completely before removing lid. To trim kale leaves from the rib, lay a leaf upside down on a cutting board.Then use a paring knife to cut a V shape along both sides of the rib, cutting it free from the leaf. Per Serving: 215 calories; 16g fat; 17.9g carbohydrates; 4g protein; 5mg cholesterol; 218mg sodium. Right up my alley! Vegetables in a coconut curry sauce is my personal comfort food. First time making such a dish in the pressure cooker. I'm not complaining about how little there was to cleanup afterwards, for sure. Obviously the curry you use will have a huge influence on the final dish, so find one you trust. Find Mae Ploy if you can. The big chain grocery may not carry it, but if you have a family owned Asian grocery near you, they almost certainly will. Not too spicy with bright, bold flavor. I was so impressed by how this Thai curry turned out! It was so delicious! I served it over plain brown rice, it was very good. Even better the next day. Such an easy recipe, and incredibly quick and easy to make in a pressure cooker! When I saw the fast cooking times, I was in shock. Love it! This dish was so aromatic, it literally made my entire house smell so good! My sister and I devoured all of this curry over a hot bed of rice. So delicious. Perfect amount of flavor and spice. I added more veggies to this red Thai curry, like mushrooms, snap peas, and water chestnuts. It was really good! The coconut milk gave it that distinct taste, as did the curry paste. Delicious, I'd love to make it again soon. Delicious and fast! This is the first recipe I’m making with my brand new Mealthy pot. I did use shredded carrots - so much easier than chopping- and estimated for 3 large carrots. Loved the sauté function! Clean up will be a breeze with only one pot. I used grocery store curry paste. I will do as suggested in one of the other comments and get another kind in an Asian store. Very good! I used red curry paste from Thai kitchen because it was at the grocery store. I didn't have any fresh ginger so I used ginger powder, of which one tablespoon was too strong for this dish. After I moved 90 miles from my favorite Curry house 3 yrs ago- I haven’t been able to find a place that comes close! The only thing that was missing from this recipe was a potato- and that was a quick fix! (I did add a bit more curry paste than called for to cut the sweetness down) While it isn’t an exact match- it’s close enough to satisfy my coconut curry cravings! I’ll eventually explore adding chicken to it- but it’s tasty even without it. This is absolutely delicious! The only changes we made, was to use spinach instead of kale. Since spinach cooks so much quicker than kale, I added it to the curry just a few minutes before serving. We served it over white rice. I will make this again and again. I’m new to my MultiPot so trying new things! I added broccoli and cauliflower that was in the refrigerator. As per recipe, I sautéed the onions, then the garlic and ginger, then added the other vegetables. Mixed in the coconut milk and curry paste. Set the timer to 1 minute pressure. Ding done! It was really tasty. A couple of changes I’ll make next time - spice it up by adding some cayenne - have crunchier veggies by skipping the sauté before the pressure - a thicker sauce by cutting the water by half. This is so much fun! I’m falling in love.